Bryan Fuller's Teasing Us With This Star Trek: Discovery Alien, Isn't He? Bryan Fuller put an image of a Star Trek: Discovery make up test online yesterday. And my is it familiar. 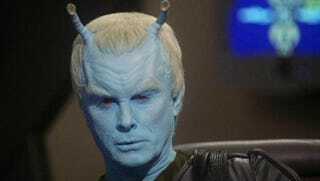 It looks like the options are either a new species or Andorian. Without knowing the texture or, more revealingly, the color, it’s impossible to know for sure. Bryan Fuller has already said that there’s a clue about the era in which this show is set in the ship’s registration number. The Discovery’s number is lower than the Enterprise’s, hinting that the ship is younger than the Enterprise. Which might mean that the new show is set in the Original Series time frame or earlier. Assuming there’s an in-universe explanation for the differing antennae—other than the Andorians Kirk encountered having unusual ones—small antennae could indicate an era further back in time, closer to when Captain Archer was dealing with them. And now that I have fully lost it based on a make up test, I am going to put my tinfoil hat on and talk about Roswell for a bit.